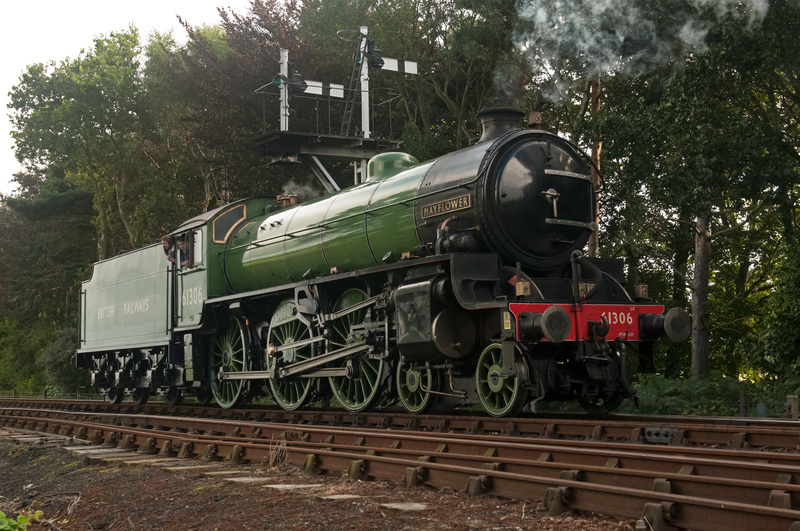 Join the NVR and take the chance to ride behind LNER B1 No 61306 Mayflower as she visits the NVR. Join the NVR and take the chance to ride behind LNER B1 No 61306 Mayflower as she visits the NVR between her main line duties. Norskinoo Gallery We are pleased to announce that Railway artist Wrenford Thatcher will be present with his gallery, with a full display of artwork, Meet Wrenford and see him at work painting over the weekend. 61306 was privately purchased for preservation at Steamtown Carnforth, one of just two preserved Thompson B1s, the other being LNER-built No. (6)1264. At Steamtown it was painted into LNER Apple Green Livery, given the number 1306 and the name Mayflower. 1306 would have been its allocated running number had the LNER not been nationalised (most ex-LNER BR numbers being the LNER 1946 numbers with the addition of 60000), while the name Mayflower came from a scrapped BR-built Thompson B1, numbered 61379. In 1978, it moved to the Great Central Railway in Leicestershire, where it remained until 1989, when it was taken out of service for a ten-year overhaul. Scheduled to return to Hull Dairycoates, the sale of the site meant that it moved to the Nene Valley Railway. Sold privately in 2006 to the Boden family, it moved to their company, Boden Rail Engineering Ltd, in Washwood Heath, Birmingham. In 2013, she returned to steam wearing her original BR Apple Green livery and 61306, operated by West Coast Railways from their base at the former Steamtown Carnforth. In 2014, 61306 was sold by the Boden family to David Buck, and moved to the North Norfolk Railway. It was prepared there for full mainline running, operating the Cathedrals Express from Norwich to Windsor, its first mainline operating since the mid 1970s.